Provides a framework in which employees can seek help in order to resolve any addictions rather than a framework under which they will automatically be punished. 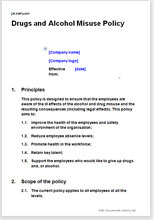 Health and Safety legislation ensures that employers are responsible for prohibiting drug and alcohol misuse. Turning a blind eye is no excuse. If your employees drive in the course of their employment, you should be aware of duties under the Road Traffic legislation. These require drivers not be under the influence of drugs or alcohol.